A logical switch is distributed and can span arbitrarily large compute clusters. This allows for virtual machine mobility (vMotion) within the datacenter without limitations of the physical Layer 2 (VLAN) boundary. The physical infrastructure does not have to deal with MAC/FIB table limits since the logical switch contains the broadcast domain in software. VXLANs no longer require the physical network to support multicast in order to handle the Broadcast, Unknown unicast, and Multicast (BUM) traffic within a logical switch. Click Networking & Security and then click Logical Switches. Click the New Logical Switch icon. Type a name and description for the logical switch. Select the transport zone in which you want to create the virtualized network. The Scope Details panel displays the clusters that are part of the selected transport zone and the services available to be deployed on the scope. Unicast: The control plane is handled by an NSX controller. 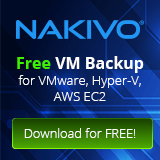 All traffic replication is handled locally by the hypervisor. No multicast IP addresses or special network configuration is required. Hybrid: The optimized unicast mode. Offloads local traffic replication to physical network. This requires IGMP snooping on the first-hop switch, but does not require PIM. First-hop switch handles traffic replication for the subnet. Connecting a Logical Switch to an NSX Edge services gateway or an NSX Edge logical router provides East- West traffic routing (among the logical switches) or North-South traffic routing to the external world or to provide advanced services. In vSphere Client Click Networking & Security and then click Logical Switches. 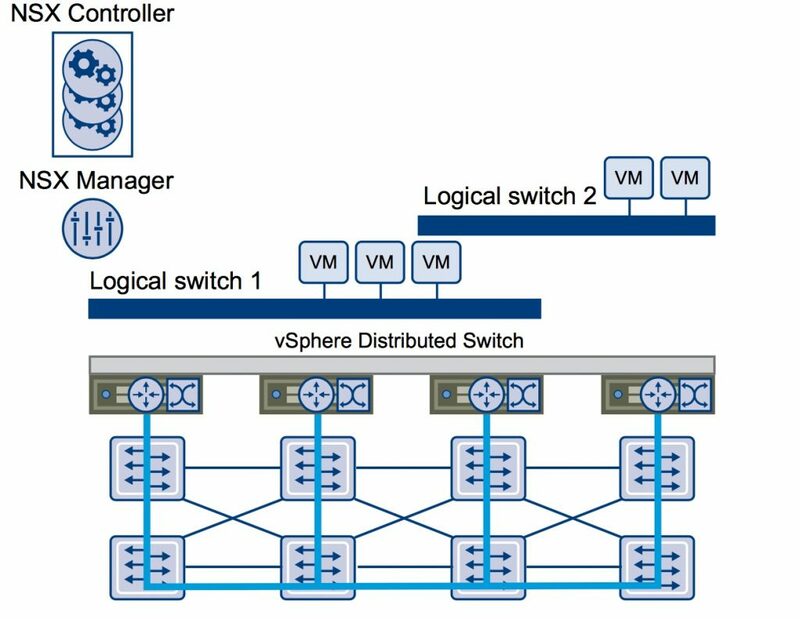 Select the logical switch that you want to connect an NSX Edge. Select the NSX Edge to which you want to connect the logical switch and click Next. Select the interface that you want to connect to the logical switch and click Next. A logical network is typically connected to an internal interface. Select the connectivity status of the interface. If the NSX Edge to which you are connecting the logical switch has Manual HA Configuration selected, specify two management IP addresses in CIDR format. Edit the default MTU if required. 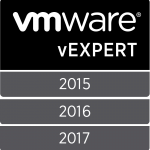 Click Next and Review the NSX Edge connection details and click Finish. In vSphere Client click Networking & Security and then click Logical Switches. Select the logical switch on which you want to deploy services. Login in vSphere Client and click Networking & Security and then click Logical Switches. In the Name column, click the logical network that you want to test. You configure VXLAN on a per- cluster basis, where you map each cluster that is to participate in a logical network to a vDS. When you map a cluster to a switch, each host in that cluster is enabled for logical switches. The settings chosen here will be used in creating the VMkernel interface. For the cluster on which you want to configure VXLAN, click Configure in the VXLAN column. In the Configuring VXLAN networking dialog box, select the switch to which you want to map the cluster. Type the Maximum Transmission Units (MTU) for the virtual distributed switch -> VXLAN traffic frames are slightly larger in size because of encapsulation, so the MTU for each switch must be set to 1550 or higher. You should choose a teaming policy for VXLAN transport based on the topology of your physical switches. 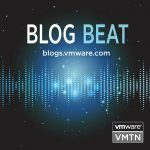 For certain teaming modes, VMware software creates multiple VTEPs to load balance traffic among the physical vNICs. LACPv1 -> no multiple VTEP created. Note: Static Lag and LACP is supported with one VTEP and multiple uplinks. LACPv2 -> no multiple VTEP created. Note: Static Lag and LACP is supported with one VTEP and multiple uplinks. Login in Web Client and click Networking & Security and then click Installation. You can create an L2 bridge between a logical switch and a VLAN, which enables you to migrate virtual workloads to physical devices with no impact on IP addresses. The L2 bridge runs on the host that has the NSX Edge logical router virtual machine. An L2 bridge instance maps to a single VLAN, but there can be multiple bridge instances. The logical router cannot be used as a gateway for devices connected to a bridge. 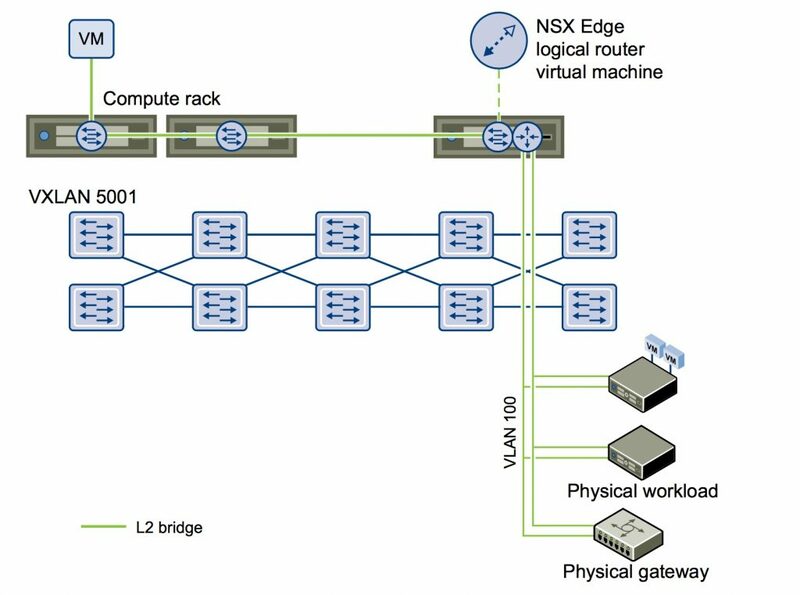 Note: an NSX Logical router must be deployed in order to add L2 Bridge.